VERRUCULARIA Adr. Juss., Ann. Sci. Nat. Bot., Sér. 2, 13: 327. 1840.—Type: V. glaucophylla Adr. Juss. Verrucularina Rauschert, Taxon 31: 560. 1982.—Type: V. glaucophylla (Adr. Juss.) Rauschert [Verrucularia glaucophylla Adr. Juss.]. Shrubs; stipules intrapetiolar, distinct or connate at base, persistent on petiole; leaves eglandular. Inflorescence terminal, erect, an unbranched, often corymbose raceme of few-flowered cincinni or single flowers [1-flowered cincinni]; floriferous peduncles developed; bracteoles eglandular, persistent, borne at or slightly below apex of peduncle. Sepals leaving outermost petals exposed in enlarging bud, all biglandular with adjacent glands sometimes partially connate, the glands borne mostly below free part of sepals; corolla bilaterally symmetrical, the posterior petal somewhat larger than the lateral petals; petals bright yellow, glabrous or sparsely red-tomentose abaxially on claw or narrow crest of limb, denticulate to subentire; androecium radially symmetrical; stamens glabrous; filaments connate at base, longer opposite sepals than opposite petals; anthers alike, the outer locules bearing a distal line or cluster of vesicular outgrowths; pollen 3-colporate, the colpi distally bifurcate; receptacle glabrous; gynoecium radially symmetrical; ovary with the carpels 3, connate along a broad adaxial face; styles 3, slender and subulate with minute stigmas. Cocci 3, borne on a flat torus, smooth except for a narrow dorsal keel. Chromosome number: n = 6 (W. R. Anderson, 1993a). Two species, both Brazilian [map], one from sandy savannas on Serra Aracá in Amazonas near Venezuela, the other from shrubby vegetation on sandstone hills in central Bahia. 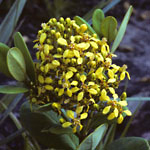 Verrucularia resembles its sister genus Galphimia in many characters, but the latter has glands on the leaves, the flowers are always single [i.e., the cincinni have all been reduced to one flower], the sepals are eglandular or bear at most 1–5 very small glands borne singly at the base of the sinus between some or all adjacent sepals, and the anthers bear no outgrowths. Reference: W. R. Anderson, 1981b (pp. 45–48, partial revision [Verrucularia only: pdf; entire paper 20 MB: pdf]). Etymology: The name Verrucularia is from the Latin word for small wart (verrucula), referring to the tiny vesicular outgrowths borne near the apex of the anthers.